A RWYM coaching session differs from conventional ‘lessons’ in many ways. Discover how your own biomechanics influence your horse. No matter what horse you ride, your chosen riding disciplines, and your overall riding ambitions, this approach will benefit you both. 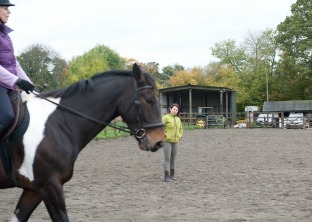 I teach flatwork and jumping lessons to clients across Surrey, Hampshire and Sussex. I am an accredited Ride with Your Mind (RWYM) Coach, and a BHS Registered Instructor. I also offer flatwork schooling of your horse and regular clinics. Read my latest insights, horse and rider case studies, learnings and tips from my attendance on Mary Wanless training sessions and various courses. Plus a range of helpful resources and articles to help you get the most from your partnership with your horse. Hi, I’m Sally Ede and thanks for dropping by my website. I am an accredited Ride with Your Mind (RWYM) Coach, and a BHS Registered Instructor. I have broad experience in the equestrian industry; having produced my own horses to compete at national championship level, and worked in a variety of training environments. As a coach, my aim is to foster a close interface between horse and rider, which empowers them both, and builds the foundations of a good partnership. I have a logical, welfare based approach to training, which aims to improve both the athletic and mental performance of horse and rider, using individualized teaching methods, and a sound knowledge of horse and rider biomechanics. I combine many years of experience with my own passion for constantly learning and updating my own skills, to provide a professional teaching service. I am also fully qualified in Equine Faciliated Human Development and Learning which adds a new and exciting dimension to my skillbase. 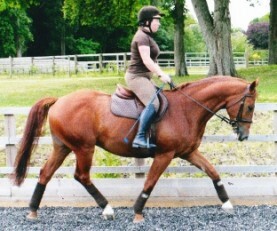 I am a full time freelance coach, teaching flatwork and jumping lessons to clients across Surrey, Hampshire and Sussex. I run clinics and workshops anywhere in the UK. I work with all levels, from improving confidence for hacking out, to refining performance for better competition results. Teaching is my passion. My enthusiastic approach brings energy, enjoyment and commitment to the learning process. The welfare of the horse in all stages of its training is of utmost importance to me. The ultimate goal of my coaching is the emotional and physical congruence of horse and rider. That they seek to be in harmony, learning from each other in a never ending cycle of information exchange.